There's no doubt: a white kitchen looks clean and sleek while a dark cherry kitchen exudes grandeur and sophistication. But there's also no doubt that these looks have been done to the point of being overdone, so when you want to supply some warmth to your Dallas kitchen with a look that will never become dated, consider using modern wood in the kitchen. Here's how you can design an earthy kitchen in your Dallas home using modern wood additions. Just what exactly is “modern wood”? It's neither too light nor too dark. Think in terms of natural, stained walnut or, better yet, a weathered reclaimed wood. So much the better if you use organic and natural materials because you'll end up with a timeless look that is earthy and beckoning. And if there's one room in your home that you want to be inviting, it's most likely your kitchen, the “heart” of a home where most people naturally congregate. With cabinets framed by few embellishments (meaning the trim). Here, wood should be the main attraction. This doesn't mean you can't unleash your imagination and have fun with drawer pulls and door handles, but let the richness of the wood dictate your choices. Depending on their size, wood cabinets may not “need” the distraction of decorative elements. With an open-shelf island, augmented by plenty of metal. Opposites attract, which is why wood paired with metal is bound to generate a double-take (or two). With wooden beams along the ceiling, to create symmetry in the kitchen and to encircle the room in warmth. With a distinctly wooden kitchen table, a small but important detail that will bring cohesion to your earthy kitchen. 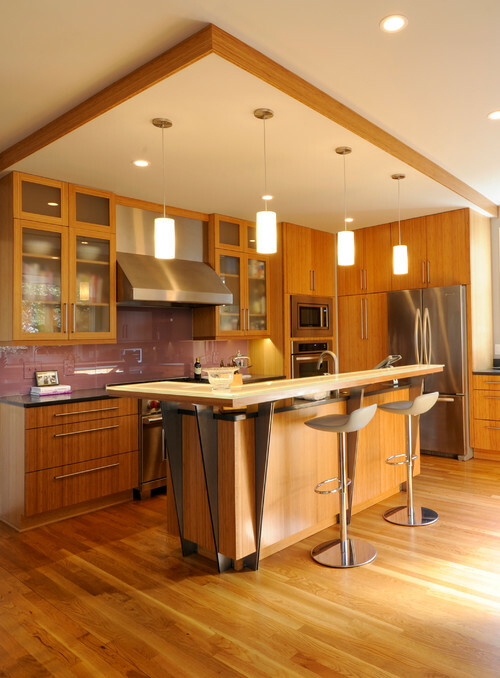 If you're warming up to the idea of how modern wood in the kitchen can make your heart skip a beat, call Stephanie Kratz Interiors for a consultation today.